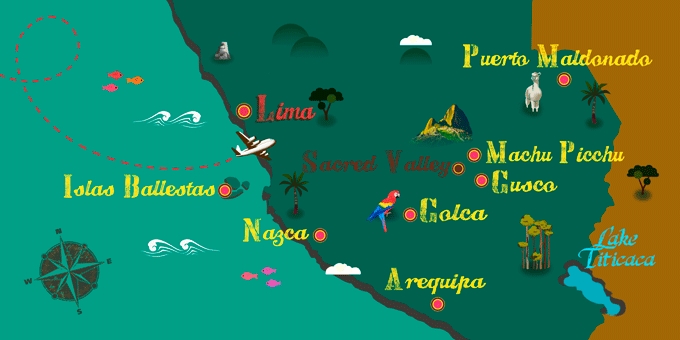 Peru is known for its crafts, especially handmade textiles and ceramics. Some of the most sought-after products by travelers are the brightly colored ponchos or the champas, the fat wool jackets with different motifs typical of the country. Also, caps, backpacks, and vests are some of their best-selling garments. In ceramics, you can find a great variety of products. They are often a reddish color, typical of the Moche pottery, or black in color with Inca motifs or Nazca designs. Other products in great demand are musical instruments such as ocarinas, pan flutes or panpipes. Many of these products can be easily found in the capital, Lima, in its Central Market, although prices will be somewhat higher than in some towns. Some of the best places to shop in Peru are in the Andean area: Cuzco, Arequipa or Huaraz, where there is a great variety of craft shops with local products. Prices in Peru are quite cheap and, although there are some shops and businesses where there is haggling, the discount is usually not worth the hassle of bargaining.